Buy Any Tract, Any Combination of Tracts or Buy the Entire Ranch!!! Buy Any Tract, Any Combination of Tracts or Buy the Entire Ranch!!!. 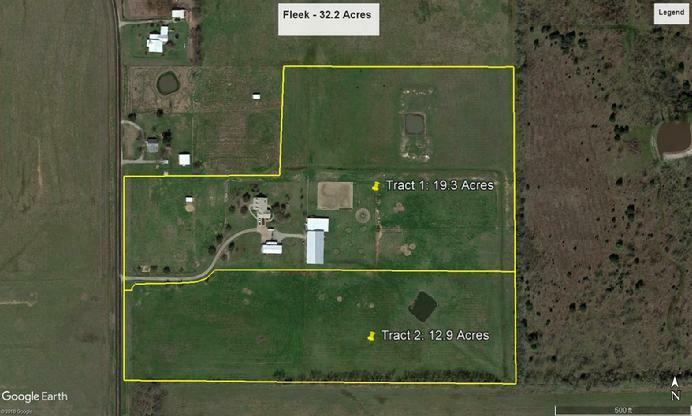 REAL PROPERTY: Selling the 31 acre Ranch on sandy loam soil, divided in 5 separate Tracts. Located just minutes East of I-35 and Denton or West of the North Dallas Tollway and less than one hour to Dallas, Fort Worth and DFW Airport. Mustang Water Supply, Aubrey Independent School District. TRACT 1: 9.7 Acres features a Custom Insulated Show Barn, 27 stalls with automatic waterers, large office/reception area with wet bar, oversized tack room, wash racks, tankless water heater, stock and kitchen/laundry room. Also an 80' x 175' covered arena with wind screens, large equipment building with ranchhand living quarters and extra storage, 6 horse walker, tie stalls, turnouts with loafing sheds and all pipe fencing. Road Frontage on FM 2931. TRACT 2: 7.5 Acres features a 3300' Brick Home with 3 bedrooms, 2 full baths, 2 half baths, 2 car garage, dry sauna in master, dual zone a/c and tankless water heater. Also a metal double door workshop, metal equipment building, MD 7 stall barn with wash rack and tack room, 2 bedroom modular home and ample pasture with pipe fencing on Blackjack Road. TRACT 3: 3.0 Acres features a 1700' white brick home, 2 bedrooms, 2 baths, 2 car garage with study nestled among mature oaks and elms. TRACT 4: 6.5 Acres of Prime Property on the corner of Blackjack Road and FM 2931. Excellent home site. TRACT 5: 4.1 Acres, great home site, all pipe fencing with Blackjack Road frontage. LIVE AUCTION: The real property will be offered for sale in a live, audible auction, conducted by a licensed Auctioneer on Saturday, May 18, 2019 at 11:00am CST. The auction will be conducted on-site, at the ranch located 2389 E. Blackjack Road in Pilot Point, Texas. On-site registration will begin at 9:00am on the day of the auction. The property will sell "AS IS". It is the sole responsibility of a potential Buyer to inspect and research the property prior to the auction. REAL ESTATE TERMS: A 10% Buyer's Premium will be added to the high bid attained at auction to constitute the total contract price. The 10% Buyer's Premium will be paid the day of the auction when the contract is executed. The balance will be due at Closing, on or before, Tuesday, July 9, 2019 at 5:00pm CST. Buyer is responsible to attain his or her own financing prior to closing. ONLINE BIDDING FOR REAL ESTATE ONLY: If you are unable to attend the live auction held at 2389 E. Blackjack Road...you can participate in real-time online bidding that will be available through PROXIBID beginning at 10:30am CST on the day of the auction. Pre-registration with www.proxibid.com is required. AGENT INCENTIVE: Real Estate Agents are eligible to receive a 2% commission. Bring your Buyer and co-register the day of the auction. The Real Estate Agent of the successful Buyer will receive a 2% commission of the auction strike price to be paid the day of Closing. NOTICE: This property will not be pre-priced and will not be sold prior to the date of the Auction. Therefore, as a prospective Buyer, you are guaranteed your opportunity to purchase this property on May 18th. OPENING BIDS: Tracts 1, 2 and 3 will have an opening bids of $100,000 and Tracts 4 and 5 will have opening bids of $5000/acre. REAL ESTATE PREVIEW: The ranch my be viewed by appointment only. Call to schedule an appointment. PERSONAL PROPERTY: Selling equipment, furniture, furnishings, crystal, fine china, artwork, collectibles and clothing. Personal Property will sell in a LIVE AUCTION that will not begin before 12:00 Noon or until the Sale of the Real Estate has concluded. Personal Property can be viewed beginning at 9am the day of the Auction, not before that date...NO EXCEPTIONS. The Personal Property WILL NOT be pre-priced or offered for sale prior to the day of the Auction. LAW: These properties are offered for sale according to the Laws of the State of Texas. Tony Langdon is licensed with the Texas Department of Licensing and Regulation (#10246) and the Texas Real Estate Commission (#488403). AUCTION: The Auctions, open to the public, will be conducted by an Auctioneer with live bidding , on-site at the physical address of each property. Active online bidding will be available through the Proxibid for those that cannot attend. Absentee and telephone bids will also be accepted. The properties are being offered for sale by “Seller Confirmation”, therefore the auction process will not be complete until the Auctioneer announces the property as SOLD. REGISTRATION: All prospective Buyers in attendance must complete a registration form and receive a bidder number the day of the auction in order to participate as a bidder. Online Bidders for Real Estate must pre-register at https://www.proxibid.com/asp/signupchoice.asp with the PROXIBID.COM in order to bid online. Online bidding is not available for personal property. REAL ESTATE AGENTS: Any Real Estate Broker/Agent actively licensed in the State of Texas who properly Co-Registers a successful Buyer will be paid a 2% Commission of the auction strike price at closing by the Seller. Broker/Agent Co-Registration with a Buyer is available only on the day of the Auction and must be completed prior to the scheduled starting time of the Live Auction. Broker/Agent must Co-Register with the prospective Buyer in person, attend the Live Auction and be present upon the execution of the Sales Contract to be eliglble for the Commission. A Real Estate Broker/Agent is not eligible for a Commission when participating as a Buyer/Principal in the purchase of a property, retains any ownership in the Real Estate Firm named at Registration or represents a Buyer that is an immediate family member. CONDITIONS: The properties are sold “AS IS, WHERE IS” with all faults, if any. No warranty or guarantee of any kind, either expressed or implied, is made with respect to each property. Buyers acknowledge they have inspected the property and are buying it in its present condition. All announcements made on sale day by the Auctioneer will hold precedence over any previous printed material or any other oral statements. BIDDING PROCEDURE: The properties will be offered for sale at Auction in either a lump sum amount or at a cost per acre. Opening bids for each property will be listed prior to the Auction. Minimum acceptable advance in live bidding is $1000 unless otherwise amended by the Auctioneer. BIDDING DISPUTES: In the event of a dispute between two or more bidders, the Auctioneer at his own discretion may open the bidding again only between the parties in dispute. It is the responsibility of the disputing party to advance the bid with the Auctioneer presiding. If there is no advance in the bidding the property will be sold to the person whom the Auctioneer recognized with the last bid. Tony Langdon Auction Properties or its Auctioneers may decline any bid made by parties who have defaulted in former purchases, or by persons who are deemed not responsible bidders. TERMS: A Buyer’s Premium will be added to the successful bidder’s high bid. The Buyer’s Total Contract Price will be comprised of the high bid achieved at auction plus the buyer’s premium. The Buyer’s Premium will be paid the day of the auction, serving as your deposit, payable to Tony Langdon Auction Properties in cash or cashier’s check. A personal or company check will be accepted only if accompanied by a bank letter of guarantee. Balance will be due at Closing in 45 days. Buyer is responsible to attain his or her own financing prior to closing. Inability to close on that day will forfeit any and all deposits, earnest money and/or buyer’s premium, as it will be considered earned with no recourse available for recovery. CLOSING: The Seller will convey a Special Warranty Deed to the Buyer upon payment of the purchase price. On property purchased utilizing Owner Financing a Note and Deed of Trust will be executed between Buyer and Seller at Closing. The Seller will be responsible for the following expenses of conveyance: Attorney’s Fees, Deed Preparation, Survey, Pro-Rated Ad Valorem Taxes and Courier Fees. The Buyer will be responsible for: Title Insurance, Title Search, Recording Fee and Pro-Rated Ad Valorem Taxes. Fidelity National Title, Denton, Texas (940.382.8200) will conduct the closing. SURVEY: The Auction will be conducted utilizing the preliminary layout that has provided in your sale brochure. The final survey, if necessary, will be surveyed by “metes and bounds” after the conclusion of the auction and prior to the closing. The final survey may have a differential of .25 acres for every 10 acres. 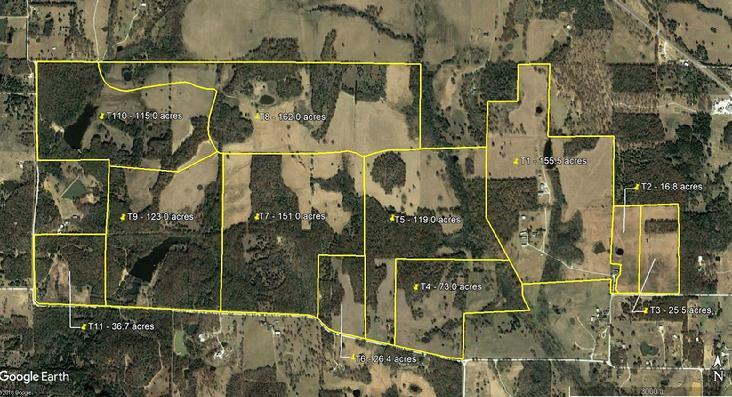 No price adjustment will be considered unless acreage differential exceeds .25 acres for every 10 acres. Fence lines are often used as guides to determine the property boundaries for division into tracts; however the final survey may differ slightly from the preliminary and aerial layouts provided in the sales information. EASEMENTS: The properties are subject to utility easements. All easements will be listed prior to the auction for each property. UTILITIES/SCHOOLS: All available schools and utilities will be listed prior to the auction for each property. MINERAL RIGHTS: Any mineral rights, if available, will be listed prior to the auction for each property. DEED RESTRICTIONS: All deed restrictions will be listed prior to the auction for each property. RESALE: Any Buyer failing to comply with the above stated conditions that shall cause the property to become the subject of resale shall be obligated to pay any and all costs associated with the resale of such property. In the event of a resale, the Buyer will be obligated to any negative balance in addition to attorney's fees that may occur as every legal remedy will be utilized for the recovery of any loss as a result of default by the Buyer. CAUTION: All attending the Auctions do so at their own risk. Prospective buyers and spectators are cautioned to be careful while on each property. Neither Tony Langdon Auction Properties, Auctioneers, Staff, Sellers nor any other person connected with this sale assumes any liability, legal or otherwise, for the safety of any individual while on the premises.